Exuberant describes it best. Its intense color stems from purplish violet. Right from the first swirl one experiences an explosion of diverse aromas with an impressive complexity. One finds raspberries, blackberries, cigars, cedar, coffee, and licorice - so many bewitching scents. The mouth starts with an enveloping feeling of softness. Then the wine expands and invades the senses. From that moment on, the extremely mature tannins take over illustrating the enormous concentration of this wine. An amazing freshness carries this tannic mass, as a railroad train would - chugging along the tracks, carrying it a long, long way to a finish of immeasurable length on the palate. No stopping, no rest, the wine simply evolves with every stage superbly managed from start to finish. Rarely has La Mission Haut-Brion achieved such plenitude. Let us say: 2006 is one of the greatest vintages of La Mission Haut-Brion. Wonderful sweet fruit, velvet in texture, with concentrated ripe fruits and red berries. This is a wine that rolls sumptuously around the mouth, the tannins certainly dense but full of the same sweetness as the fruit. The final flavor is perfumed and fresh. Deceptively attractive, it will profit from many years' aging. 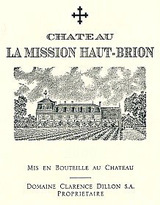 One of the vintage's top wines is the 2006 La Mission-Haut-Brion. From bottle, it reminds me of the 1998, given its structure and backward style. Dense ruby/purple-colored, it possesses a boatload of tannin, but with coaxing, tobacco leaf, sweet black currant, burning ember, and blue fruit characteristics emerge. While thick and full-bodied, the tannins seem more elevated than I remember from barrel. It is going to be a beauty, but like many of the top 2006s, considerable patience is required. Only 55% of the production made it into the grand vin as Jean-Philippe Delmas made a severe selection. The final blend was 60% Merlot and 40% Cabernet Sauvignon, and the 2006 has one of the highest natural alcohols ever achieved at La Mission, averaging around 14.3%, which is astonishingly high for a Graves. Anticipated maturity: 2018-2035. Almost jammy, with vanilla bean and coffee undertones. Full-bodied and very powerful, with big, juicy tannins and a long finish. Very big and generous for the vintage, showing exceptional quality. Best after 2015. Medium ruby-red. Roasted redcurrant, scorched earth, minerals, roasted herbs, Cuban cigar tobacco and licorice on the rather forbidding nose. Densely packed but with a light touch thanks to penetrating acidity and minerality. Showing no easy sweetness today, with red fruits lurking in the deep background. Finishes with chewy, serious tannins whose youthful toughness calls for a decade of aging.